Téa is a freshmen at Domino High School. Her dream is to visit New York and study dance. While that’s not happening, she spends her free time at school with her friends. She worked at a burger place called “Burger World”, but a criminal there stopped that. Yugi had saved her from getting shot down. That was when Tea started wondering about the person that had saved her, and her friend Yugi. She is often found with Yugi and is sometimes mistaken for his girlfriend. Yugi would love that to happen, but perhaps Tea finds safety in the fact that their just friends. Tea cares a lot about her friends and shows it on a regular basis. Tea can’t stand Mai. She only puts up with her because she’s another duelist. Later down the road Tea and Yugi find themselves together, accepting each other for who they really are. Among all of Yugi’s friends, Téa is the voice of reason. 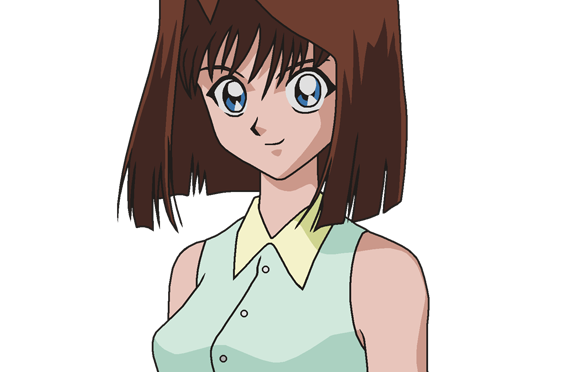 A childhood friend of Yugi’s, Téa is also the biggest cheerleader in the group, always encouraging everyone to believe in themselves and to never give up. Téa loves her friends so very much and is willing to help them in any way she possibly can.